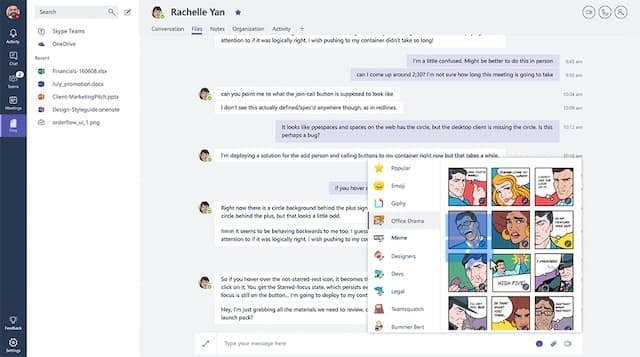 Microsoft will announce a new web based chat product, called 'Microsoft Teams' on its November 2, Microsoft Office event in New York City. The new product is likely to compete with the already established player, 'Slack' which has become the de-facto destination for teams to communicate with each other for all work-related communications. We learn that the product will be web-based with desktop and mobile apps for various platforms. Leaked screenshots reveal a lot about the product. First, the design seems to be inspired from Slack's interface. Expect channels for groups, private messaging between members, file sharing among group along with some fun elements like animated gifs. We also learn that the product has been tested by Microsoft employees for the past few months. It's interesting to note that the product was called 'Skype Teams' and the login pages was put up at teams.skype.com. Microsoft has switched the login to teams.microsoft.com which now redirects to Office 365 login page. Expect Skype's video/audio calling feature integrated with Teams. Microsoft already has an ever-growing user base of Office 365 users and the new 'Teams' feature is likely to hold them from using Slack for team communication. Do you think Slack's need to worry?